This is what China desperately does not want the world to see: trouble in Tibet. Protests led by Buddhist monks against Chinese rule in Tibet turned violent on Friday, with shops and vehicles torched and gunshots echoing in the streets of the ancient capital, Lhasa. A radio report said two people had been killed. The largest demonstrations in nearly two decades against Beijing's 57-year-rule over Tibet come at a critically sensitive time for China as it attempts to portray a unified and prosperous nation ahead of the Olympic Games in August. Beijing fears such protests will mar the Games, prompting angry comments from government officials earlier this week. On Thursday Chinese Foreign Ministry Spokesman Qin Gang said, "We will strongly oppose any attempts to split Tibet from China." 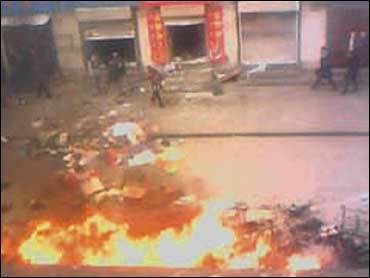 Witnesses reported hearing gunfire and seeing vehicles in flames in the city's main Barkor shopping district in the center of Lhasa. Crowds hurled rocks at security forces and at restaurant and hotel windows. Radio Free Asia, a radio station funded by the U.S. government, quoted witnesses as saying that two bodies were seen lying on the ground in the Barkor area, a shopping district in the old city on which the protests have been centered. It said other reports put the death toll higher, but gave no figures. "Shops were burned down," Tenzin Norgay of the Tibetan Center for Human Rights and Democracy told CBS News correspondent Barry Peterson. "Around mid-noon it was totally in chaos and the situation was very, very intense - there was like smoke everywhere, cars burning, shops burning, protesting monks." In Dharmsala, India, the Dalai Lama appealed to the Chinese leadership to stop using force and address what he calls the "long-simmering resentment of the Tibetan people through dialogue." The leader of Tibet's government-in-exile said in a statement issued Friday that he is "deeply concerned" about the situation in Tibet. The Dalai Lama also urged Tibetans to refrain from using violence. The protests that began Monday, initially led by hundreds of Buddhist monks, appeared to be attracting large numbers of ordinary Tibetans. Shops were set on fire along two main streets surrounding the Jokhang temple, Ramoche monastery, and the city's main Chomsigkang market, sending out heavy smoke. "It was chaos everywhere. I could see fires, smoke, cars and motorcycles burning," said a Tibetan guide who spoke on condition his name not be used, fearing retaliation by authorities. He said the whole road in the main Barkor shopping area surrounding the Jokhang temple "seemed to be on fire." The guide said armed police in riot gear backed by armored vehicles were blocking major intersections in the city center, along with the broad square in front of the Potala, the former winter home of Tibet's exiled Buddhist leader, the Dalai Lama. "As I approached Potala Square, I heard cannon fire, louder than rifles. Others told me police were firing tear gas along Beijing Zhonglu, west of the Potala," he said. In a terse report, China's official Xinhua News Agency said people had been hospitalized with injuries and vehicles and shops torched, but gave few details. Tensions in the Tibetan capital have risen in recent days as the city's three biggest monasteries were sealed off by thousands of soldiers and police in a government crackdown, the U.S. government-funded Radio Free Asia reported Friday. The U.S. Embassy e-mailed an advisory to Americans warning them to stay away from Lhasa. The embassy said it had "received firsthand reports from American citizens in the city who report gunfire and other indications of violence." Travel was also halted to Lhasa on Friday for foreigners, travel agents said. "Trips to Tibet have all just been stopped in our agency. And possibly all other travel agencies have been stopped," said a woman who answered the phone at Access Tibet Tour in Chengdu, Sichuan province. She refused to give her name. "All foreign people are forbidden to go to Tibet now. But Chinese people are free to go," said an agent at China Youth Travel Agency in Lhasa. He also refused to give his name. Hotels in the area were placed under lockdown at noon, said a hotel worker in downtown Lhasa. "No one has been allowed to leave the hostel, as protesters on Beijing Dong Road have turned violent ... we can hear shouting and a loud commotion outside, but cannot even look outside the windows to see what is happening outside, because they will throw rocks at us if they see us," said the worker, who did not want her name used or her hotel identified for fear of harassment by authorities. An official from the Tibetan government's office of emergency affairs who identified himself as Ren Yong said "People are now dispersed. I have not heard of a curfew." He gave no other details. It is extremely difficult to get independent verification of events in Tibet since China maintains rigid control over the area. Foreigners need special travel permits, and journalists are rarely granted access except under highly controlled circumstances. Chinese Communist troops occupied Tibet in 1951 and Beijing continues to rule the region with a heavy hand. Beijing enforces strict controls on religious institutions and routinely vilifies the Dalai Lama, who fled to India in 1959 amid an aborted uprising against Chinese rule and won the 1989 Nobel Peace Prize. Tibetans inside and outside the country have sought to use the Olympic Games' high profile to call attention to their cause. Beijing has accused the Dalai Lama - whom many Tibetans consider their rightful ruler - of trying to sabotage the games. The protests by the Buddhist monks in Lhasa began Monday, the anniversary of a failed 1959 Tibetan uprising against Beijing rule. They are a stunning show of defiance for Tibetan monks who are usually closely monitored by Chinese officials. Hundreds of monks from Labrang monastery were also protesting in the streets of Xiahe, a predominantly Tibetan county in western China's Gansu province, said Matt Whitticase of the Free Tibet Campaign. There were no reports of police action so far, he said. On Thursday, monks in Lhasa started a hunger strike and two attempted suicide as troops surrounded monasteries in a government crackdown on the widespread protests, RFA said. "Initially the security forces surrounded the monastery and attempted to contain them, because they know from history that once you start arresting monks, the general population get a bit irate and come out in droves," said Anna Holmes, director of the Free Tibet Campaign. "But the last we heard was that they have started arresting monks, and that the population are starting to come out and protest as well." These are believed to be the largest demonstrations in the city since Beijing crushed a wave of pro-independence demonstrations in 1989. Since then, China has pumped investment into the region, vilified the Dalai Lama and tried to weed out his supporters among the influential Buddhist clergy. Beijing maintains that Tibet is historically part of China. But many Tibetans argue the Himalayan region was virtually independent for centuries and accuse China of trying to crush Tibetan culture by swamping it with Han people, the majority Chinese ethnic group. The unrest comes as China holds its annual legislative session, which puts on a high-profile display of national unity, especially for minority groups such as Tibetans. In northern India, organizers said more than 100 Tibetan exiles began two weeks of detention after police arrested them during a march to their homeland to protest China's hosting of the Olympic Games. March coordinator Tenzin Palkyi said Friday the exiles are being kept in detention in a state-run hotel while authorities investigate charges they threatened the "peace and tranquility" of the region.